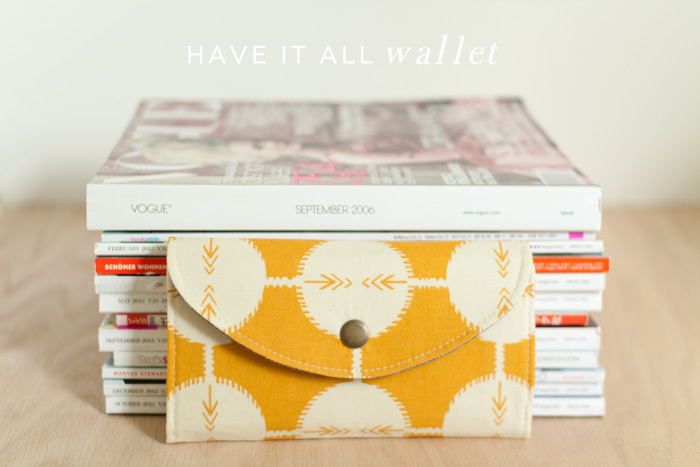 have it all wallet pattern. . . I made my first wallet way back in 2009 and used it for almost 2 years. I liked it so much that when it came time to make a new wallet, I made the same one again with a few tweaks (I replaced the change pocket with more card pockets). Lately, I noticed that my current wallet was looking rather dingy but wasn't sure if I wanted to make another one or just buy one. 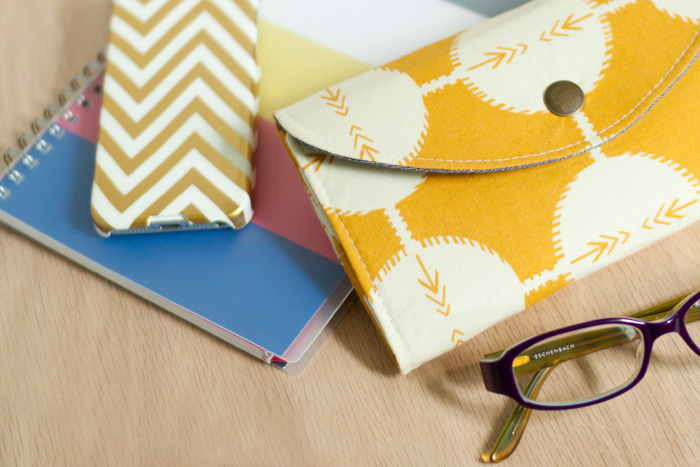 Luckily, I came across the Have it All Wallet pattern by Straight Stitch Society either while browsing blogs or Pinterest and thought I'd give it a try. I finished it up yesterday and it is now officially residing in my bag. This thing has a TON of pockets which means it has plenty of space to carry stuff. It really is more of a wallet/clutch hybrid - you can stash a phone in it plus a lip balm or two in addition to your usual wallet stuff. 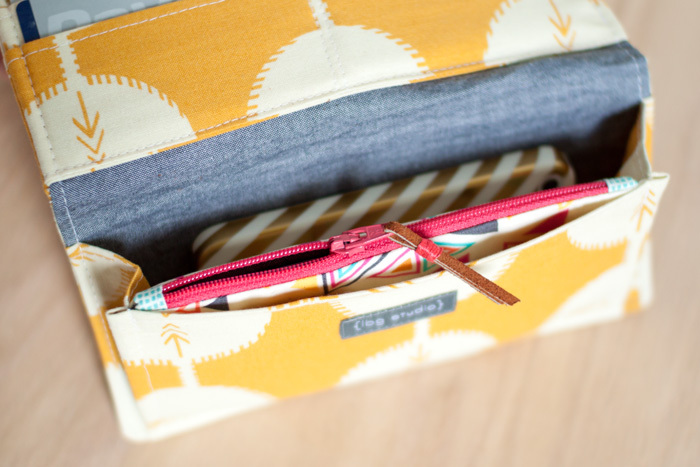 I really love the accordion style pocket + zipper pouch - so fun! Overall it was easy to make. It took me forever to pick fabrics but that's how it usually goes for me. The only change I made was adding more interfacing - I used Craft Fuse for the outer part of the wallet as well as the lining piece and used Pellon SF101 for everything else. I added a jumbo metal snap for the closure. Impeccable! Perfect fabric choices too. really nice! I need a new wallet so badly :( I wish I would just take some time to make some stuff for myself! Super cute! Would love to try this pattern. oooo!!! love! I might have to try that. I've become slightly obsessed with finding a wallet that I like lately. Although my cheap-o target one is doing just fine as of late. Oh, that is lovely. What a great pattern. And sewn so beautifully! this is just perfect, vanessa! it looks so incredibly pro, and looks so functional too. very nicely done. this is amazing! Great fabric choice too. Love your fabric choice and the big snap closure. Must check out that pattern. My old wallet is literally bursting at the seams (not because there's too much money in it, sadly). Love it!!! I think that AMH fabric is so perfect!!! 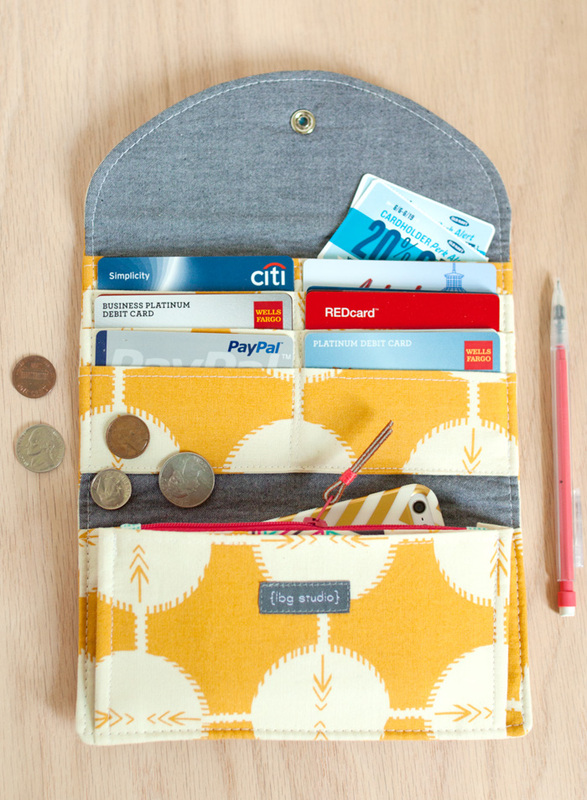 The wallet is perfect, practical and adorable!!! I usually get interfacing at Hobby Lobby or Joann so I can use a coupon! I am in desperate need of a new wallet and have seen a few versions of this wallet on pinterest. I need to bite the bullet and buy the pattern! I will have to try this one!! The problem with most wallet patterns was that they were too small. I am addicted. I ordered the pattern only a day after seeing your wallet and I have made four since. Thank you!!! Where do you get your name labels that you sew into your projects? They are very attractive. You should make these and sell them. It looks GREAT! I used Craft Fuse for the outer pieces and the main lining piece and Pellon Shapeflex for everything else. I didn't use any sew in. Hope that helps! Could I buy one like that from you? Hi Kayla! Sorry, but no - I don't make things to sell. Just don't have the time, etc. I'm also pretty sure that this particular pattern does not allow for that anyways.